This new book by Harvard psychology professor Pinker—also a bestselling writer, cognitive scientist and linguist—shows how the art of writing can be a form of pleasurable mastery and a fascinating intellectual topic in its own right. It’s an excellent resource for writers of all kinds and for readers curious about the ways in which the sciences of mind can illuminate how language works at its best. The JCCSF presents Pulitzer Prize-finalist Steven Pinker discussing his latest work, The Sense of Style: The Thinking Person's Guide to Writing in the 21st Century. Click here for more information. Non fiction: available in paperback. All are welcome! 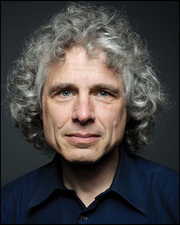 Steven Pinker discusses The Stuff of Thought: Language as a Window into Human Nature. Steven Pinker , The Stuff of Thought: Language as a Window into Human Nature. Steven Pinker is currently considered a "single author." If one or more works are by a distinct, homonymous authors, go ahead and split the author. Steven Pinker is composed of 17 names. You can examine and separate out names.